The paper covers seven transition countries: the Czech Republic, Hungary, Poland, Slovakia, Slovenia, Bulgaria and Romania. Section 1 describes the changing patterns of value added by broad sector, showing the process of de-agrarization, de?industrialization and tertiarization which the CEECs have undergone over the transition period and providing an overview of inter-country differences. Section 2 examines the changes in employment patterns that have evolved during the transition period. Further it compares the employment patterns in the European Union with those in the CEECs and shows where there is an employment absorption potential in the individual transition countries. Section 3 deals in detail with the developments in the CEECs' services sector and its individual segments and again compares these with the EU countries. 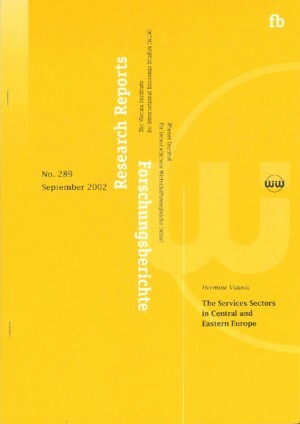 Section 4 analyses the regional dimension of the services sector in the CEE economies. Section 5 refers to the impact of FDI on the development of the services sector (especially the market services sector) and section 6 gives an overview of the tertiarization process country by country. Section 7 offers some concluding remarks.